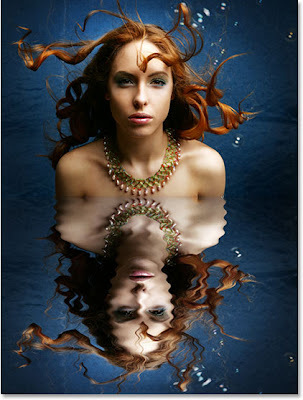 Description: This is an awesome photoshop tutorial about adding realistic water reflection to any photograph, written By Steve Patterson at photoshopessentials.com. Personally I loved this tutorial and thats why I'm sharing this with you. After reading thousands of photoshop tutorials , you probably know by now that there is nothing new or groundbreaking. Every tool is same. But it is the creativity that stands out at the end. In this Photoshop photo effects tutorial, we're going to learn how to easily add a realistic water reflection to any photo. It's a very easy effect to create and you can add it to any photo you like, although it tends to work best with images that don't already contain water in them. We'll be using a simple filter and a displacement map to create the water ripple effect, and a Hue/Saturation adjustment layer to give our water a little color. So, enjoy this fabulous tutorial. I have a blog about Narcissistic Status Messages that's just for fun. This water reflection image would be perfect for the bio image. Would you mind if I used it? I promise, I won't put it anywhere else but on the blog spot page. Thank you for your comment. Please go ahead. You can use this as your bio image. Thank you so much! And I failed to mention the image is beautiful.